Never paying more, as all bookings are handled directly with owners. 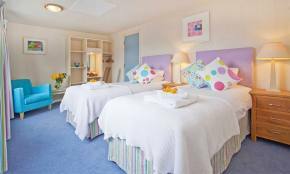 Owner's offer: as well as spa membership and free entrance to the Tresco Abbey Gardens (usually £12pp) Tresco are also happy to provide complementary bike hire to all Holiday Tot guests. What a magical Island – a real paradise for the kids, Tresco is a car fee zone so perfect for the little ones to run free and enjoy the family holiday without the worry. The Island is less than 30 miles off the coast of Cornwall and is only 2 ½ miles long. 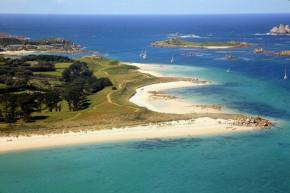 It is Britain’s largest privately owned Island and the quality of service is fantastic. 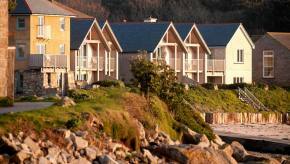 You will find luxurious accommodation, amazing food, excellent facilities and the most amazing views from your cottage. You will be forgiven for thinking you are abroad with the clear blue seas and sandy beaches on your doorstep. The Island is perfectly located to be a fantastic base to explore the other Islands of Scilly with the inter-island boat service. Go off and explore and have an adventure! There is so much to do on the Island if you wish to stay put. The sandy beaches in themselves will provide hours of entertainment for the little ones. The Greenland and woodland are right on your doorstep too so cycle rides and walks are lovely. Enjoy a stroll to visit the 2 castles dating back to the 19th Century or over to Abbey Gardens, the world famous sub-tropical gardens housing species unseen elsewhere in the UK. The garden house has 30 figureheads from ship wrecks from the last 200 years to see and there is also an art gallery on the island – a bit of history and culture on your family holiday. If you’d like to take part in a bit more activity you can hire a bike or even borrow a boat, windsurf or kayak from the sailing club. The bike shop also hires tag-alongs, stabilisers, helmets etc.. so you will be all set for an adventure. After all the exploring you may want to spend a bit of time in the Flying Boat Spa – its leisure facilities will ensure you have a peaceful and relaxing time. Choose from a dip in the indoor heated pool or a Jacuzzi or maybe a sauna and gym session. The tennis courts are also available and you can hire all the equipment you need. You also have access to the golf course (on St Marys Island) – all included in your stay of course. In the food store and delicatessen you will find a range of baby items so you don’t need to worry about forgetting anything from home. You will be able to purchase nappies, baby wipes and food as well as suncream and your everyday branded cereals etc.. The delicatessen has an in house bakery and sells amazing croissants and local pastries, as well as numerous local cheeses and a wide range of wines. If you fancy eating in but without the hassle, you can arrange for a chefs dine in option – fantastic food ready prepared for you to pop in the oven and enjoy in the comfort of your own home. However eating out is a real treat so you don’t want to miss out on the culinary delights of the Ruin café, Flying boat restaurant and New Inn pub. All of the eateries have a great atmosphere and are suitable to eat with children. The restaurant is open 3 times a week for evening meals and mainly serving light lunches, snacks and drinks daily. The Surf and Turf is something to look out for, a real special on the menu with local Island produce – amazing! The New Inn pub has regular live music and fantastic food. The pub has been awarded 4 yellow stars and a Gold Star Award from The AA for quality and service and an AA rosette for food excellence, its well worth a visit and you won’t be disappointed. The café is open daily from mid-March to early November for breakfast, lunch, afternoon tea and dinner. We don’t think you can beat the buffet breakfast whilst on the terrace watching the kids playing on the beach, or an afternoon glass of bubbly watching the sunset – totally amazing views and fantastic memories to be made on this beautiful Island. On the ground floor there is a TV room, lounge, separate WC and kitchen/diner. 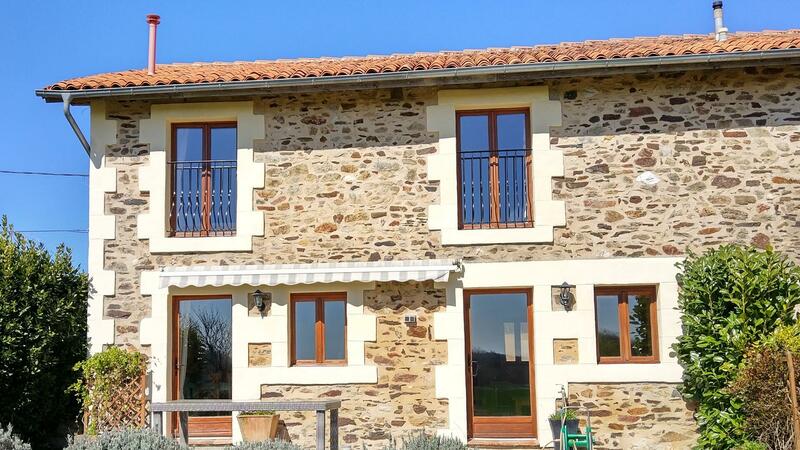 The kitchen is fully equipped with range-style cooker and American fridge. 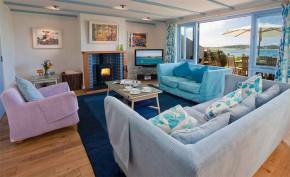 The large lounge has a log burning stove, large flat screen TV with beautiful sea views through the patio doors. The TV room has a sofa bed which can sleep 2 people. 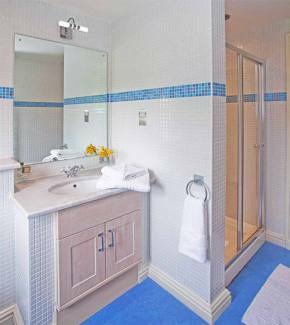 Upstairs you will find a family shower room with WC. 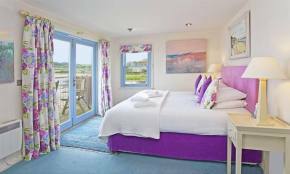 A large double bedroom with en-suite and sea views. A twin bedroom with harbor views and a family shower room with WC. And a further twin bedroom. Up another flight of stairs you will find the second double bedroom with en-suite bathroom, with patio doors to the balcony. 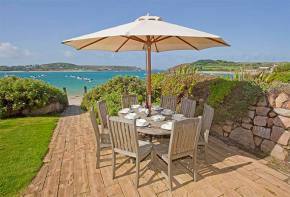 For those al fresco dining nights you can enjoy the terrace and outdoor furniture whilst taking in the amazing scenery. Baby equipment available: Cots, High chairs, Bath mats, Stair gates, Children's plates, bowls and cutlery (on request) Pushchairs can be hired from the Islands office. Hidden treehouses and swinging ropes! The island is situated 28 miles South West of Cornwall. Your holiday adventure starts by finding your way here! Most popular choice is by plane, from Exeter, Newquay or Lands End. When you arrive at St Marys airport there is a taxi-shuttle bus service down to the quay and Tresco will arrange a boat transfer for you to the Island. (This takes about 15-20 minutes) We recommend you book all your travel through Tresco – they can sort your flights to St Marys, and the taxi-bus ride to the quay and your boat transfer. They can also sort out your car parking for you at Lands End. This saves you a lot of hassle and they can take care of it all. Enquire when booking about the travel options – they will be happy to help and let you know the costs involved. Tresco is car free and most people get around the island on foot or by bicycle. You can hire a golf cart for your stay if you have mobility issues, however these need to be booked in advance as they are limited. Once you arrive on the Island, tractors and trailers take your luggage straight to your cottage. Tresco Abbey Gardens - Explore the world famous Tresco Abbey Gardens its history room, cafe & gift shop. With its exotic plant and tree life follow the maze of paths and wander along to Valhalla and investigate the world of shipwrecks at the figure head collection. Spend time seeking out the Golden Pheasants and red squirrels who have made their home here. Tresco Play Park - Next to the local primary school and community centre the play park is suitable for all ages and has a special pre-school area. Leisure Spa - Enjoy the indoor leisure facilities with heated indoor pool on-site or try the FBC Spa ideal for little ones with wide graduated steps and water jets. There is a gym, sauna, Jacuzzi, steam room and treatment rooms for Mum & Dad to enjoy. Bike Hire - Explore the island by bike. There are plenty of paths and lanes zigzagging the island through woodland and along the coast. It’s a fabulous place to learn to ride! There are child seats, tag alongs and children’s bikes of all sizes, with and without stabilisers. Nature Walks & Bird Hides - Explore Tresco’s Great Pool which is a haven for wildlife and rare birds. Children can sit comfortably hidden in the rushes peeping out through the secret windows of the Bird Hides. Flying Boat Club Restaurant - A family friendly restaurant based at New Grimsby great for refreshments and lunch during the day and a romantic setting, to watch the sunset, for Mum & Dad in the evening. Ruin Beach Cafe - A family friendly restaurant situated right on the beach with breathtaking views offering breakfast, lunch & dinner. Mediterranean vibe with a wood burning oven. The New Inn - This family friendly Inn, and the only pub on the island, offers a warm welcome and offers a baby-change facility, high chairs, pencils and colouring sheets and a good children’s menu. 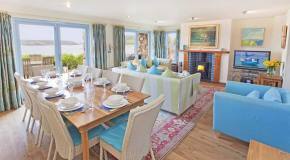 A collection of nine one bedroom luxury cottages on the stunning Tresco Island. Un-spoilt sandy beaches and lots of facilities. 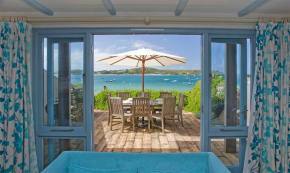 There are six three bedroom Sea Garden Cottages tp choose from on the magical island of Tresco, all offering magnificent views. 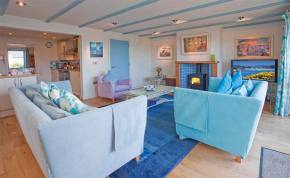 1 of 10 cottages to choose from on this amazing Island. Paradise for you and the kids, be as active or as chilled as you wish!